We’d love your help. 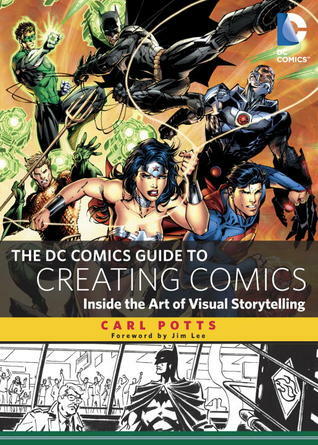 Let us know what’s wrong with this preview of The DC Comics Guide to Creating Comics by Carl Potts. The most exciting and comprehensive book yet in the bestselling DC Comics how-to-draw series. From the bestselling DC Comics Guide series, this is the essential resource for aspiring comics creators looking to make intriguing, action-packed comics like the experts at DC Comics. Going beyond the typical art and writing lessons, this book shows readers how to take full advant The most exciting and comprehensive book yet in the bestselling DC Comics how-to-draw series. To ask other readers questions about The DC Comics Guide to Creating Comics, please sign up. Stick to your intuition and glean everything you need to know about creating comics from Batman: Year One by Miller and Mazzuchelli and timeless, classic visual techniques introduced by but never supplanted by the Russians like Eisenstein. Fine artists, not fanboys, always wins. As the author’s assistant at Marvel Comics and later as one of his staff editors when he was editor in chief for the Epic line, my review is unquestionably biased. But that should only make it more helpful to potential readers. These are the lessons I learned during my first few weeks as Carl Potts’s assistant editor, distilled into one comprehensive volume. In the years since I worked for him, there have been many times I’ve channeled Carl’s inner wisdom when reviewing the work of both new and e As the author’s assistant at Marvel Comics and later as one of his staff editors when he was editor in chief for the Epic line, my review is unquestionably biased. But that should only make it more helpful to potential readers. These are the lessons I learned during my first few weeks as Carl Potts’s assistant editor, distilled into one comprehensive volume. In the years since I worked for him, there have been many times I’ve channeled Carl’s inner wisdom when reviewing the work of both new and experienced artists. During those sessions, I’ve occasionally wished for some sort of cheat sheet because Carl had said it so much better. In this volume, that wish has come true. Rather than discussing technique, Carl Potts analyzes comic theory, a concept which goes woefully unappreciated by many of today’s creators. The book goes beyond the typical how-to manual by showing artists (and writers!) how to take full advantage of the art form’s sequential storytelling possibilities. Picasso’s abstract work probably would not have been as powerful or compelling if he had not had such a solid grounding in representational art. His knowledge of representational drawing gave him a firm base from which to abstract—he knew what he was abstracting from. Storytellers are not the only ones who will find the contents of the book insightful. It should be essential reading for all new editors at any comic book company on their first day of the job. Although I was disappointed in this book's discussion of comic book theory, such as the types of panels and their use, I am pleased to say that it offers good advice concerning story development and character motivations. I also found useful the comparison of different art styles from different artists on the same script, giving me insight into the reality that different artists think their way through comic book scripts different. Certainly useful information. In the books defense regarding my i Although I was disappointed in this book's discussion of comic book theory, such as the types of panels and their use, I am pleased to say that it offers good advice concerning story development and character motivations. A good overview, though deeper digging is needed from this intro. the best part of the book was at the end, where four artists independently interpreted a 3-page script and did pencils for it, so you could compare how they approached presenting the same information. Overall this is a pretty good book about storytelling and comic (basically just superhero) art. About 2/3 of the book is information-light, but the end, with examples of multiple artists showing the same sequence, is great. I'd love to see more of that. Great primer with comprehensive lists of books to get further into depth. More focused on art and layout than writing, but a great jumping off point if you're a beginner. This book was a big help. It is incredibly helpful for anyone looking to know more about visual storytelling and its uses with panels, its different incarnations and what they do for your story.